Located in suburb area, House in Yotsukaido is a residence that looks to merge the boundaries between private interior space and the context. a non transference glass terrace connects to the home. Thick walls surround the outdoor area, shielding the owner from outside eyes, while maintaining a sense of exposure to the nature. a single square opening cuts through the enclosure, framing a nearby retention basin and the neighborhood beyond. A solid black form cantilevers over a semi-opaque volume, inverting the traditional structural orientation. 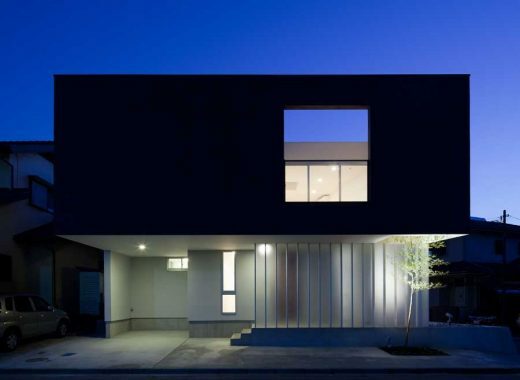 enclosing the ground floor, the cloudy surface provides an area to transition the homeowner between the contrasting atmospheres. At night, interior lights radiate through the translucent skin, illuminating the solid black mass, which appears to float in the sky.